I've started using the Zeo Sleep Manager, which uses an EEG machine to record and analyze sleep patterns and wake you up at an optimum time. I love it! Before this, I used WakeMate and liked it a lot, too, for the same reasons. It's a little weird waking up with red square spots on my forehead, but I'll tolerate the fading tattoo for the ability to wake up refreshed on as little as 5 hours of sleep. Also, the week of 1/8-14, I slept at 11:45 PM on average, while the week of 1/1-7, I slept at 1:05 AM! I think I usually sleep around 11:30 PM these days. Also, the average guy between 30 and 39 years old sleeps at exactly midnight on average. Oh, and I appear to get more deep and less light sleep than average for some reason. Of course, I've been lifting weights lately, so I would expect a lot of sleep time to be allocated towards physical recovery and rebuilding. 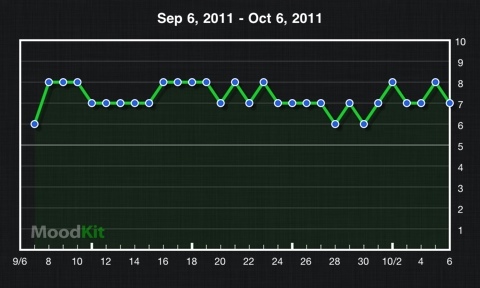 Lastly, here is what my sleep looked like last night. Light green is REM, dark is deep, grey is light, and red is awake. I haven't posted anything to this blog lately because I've actually been productive for a change and have been flooded with so many ideas that, between work, school, and personal projects, I'm amazed I'm still sleeping at night. What's happened since my last update on October 27? Started making music on the iPad and iPhone! I think that qualifies as busy. I know it qualifies as the happiest, most focused, and frustrated about lack of time I've been in a long while. But, overall, it feels good to be productive. I'm not sure if I can blame Concerta for the ideas. It may be that, and hopefully is part of it or I'm just wasting money, but I think it also coincided with being busy at work and realizing that I could make progress on my conversion idea. Because of my work on this conversion, I've learned and experimented with a ton, and I will be updating that blog soon to reflect that. The only problem I've found, which I do associate with Concerta, is another way of talking about what my prescribing doctor warned me about, which is that increased focus doesn't imply better decision making. I've found that I can focus for a long time, really in the "zone," but the downside is not having enough time to finish and not making enough time for other things. Fortunately, I haven't shriveled to a stick for lack of eating. I'm actually working out harder than ever right now with the help of a coworker. The only frustrating thing about being on a medication getting to the end of a prescription. My doctor went on vacation or leave for a whole month in November and I'm almost out of those ingenious little time-released capsules. And I have to call tomorrow to make sure I can pick up a new prescription before I leave for holiday vacation next week. Not fun. 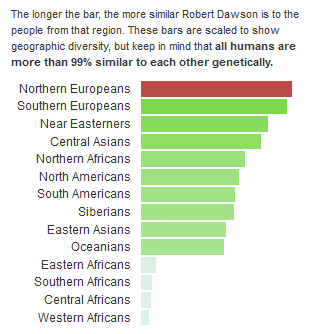 I recently joined and submitted DNA to the personal genome service, 23andme. I'll post more about what I've found later. Much of it shows no direct relevance to ADD/ADHD, but some of the findings are significant. For now, I would like to note that I have become very interested in my DNA. I know my DNA! That's crazy. Most people don't. It's understandably scary. But I haven't honestly learned that much about myself from their results. The most important finding for me has been that I process caffeine slowly, which means that having 2-3 cups a day increases my risk of heart disease. That's immediately useful information. 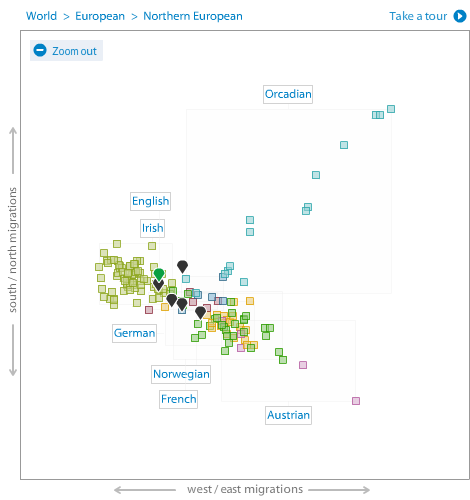 And here is a more detailed look from 23andme. I'm the green marker. This is a chart of my daily mood average since May 15, so roughly 5 months. I track my mood with an iPhone app called MoodKit. I recommend it if, like me and many with ADD/ADHD, you find yourself struggling to control your moods. This app has other tools as well to help manage how you feel. But the one thing it doesn't have is a way to track multiple moods per day. It could allow for that and still show a daily average. As you can see, I averaged an upbeat day this last month. But that doesn't tell the story. My problem is that I have quick mood shifts lasting usually no more than a few hours. So, the first half of my day might be 9/10, while the second might drop to 5/10. But the average is 7, as if I had a fairly good day, which clearly isn't true. Anyway, given the apparent prevalence of the problem, it makes sense that anyone with ADD/ADHD should track moods and I've found this an easy way to do it. If you don't have an iPhone, there are other options, like websites, forums, and, if you don't care about trees, pen and paper, that might serve you just as well.